On Sunday, August 17, Ian Petillo’s Legacy Jazz Band returns to Morgan Park Summer Music Festival. The concert, which is free to the public, begins at 7:30 p.m. in Morgan Park. Gracefully evoking the Big Band and Jazz Band eras, Ian Petillo’s Legacy Jazz Band celebrates the sounds of the 1920s and 30s with music made famous by Glenn Miller, Count Basie, Duke Ellington, Frank Sinatra, Fletcher Henderson, Tommy Dorsey, Woody Herman, Harry James, among others. 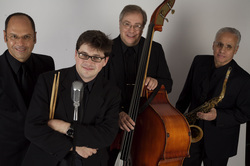 The band is also noted for its performances of Dixieland jazz and the classics of the Great American Songbook, including music by George and Ira Gershwin, Cole Porter, Jerome Kern, Rodgers and Hart, Billy Strayhorn and many more. So come on down to Morgan Park and enjoy a wonderful evening of musical entertainment under the stars. Bring a blanket or chairs and picnic if you wish. Children are welcome. Please note that alcoholic beverages are not permitted in Morgan Park. Morgan Park is located on Germaine Street at the end of Landing Road in Glen Cove. In the event of rain, the concert will be held in St. Patrick’s Parish Hall, Pearsall Avenue, Glen Cove. For further information, call (516) 671-0017. Email us atmorganparkmusic@yahoo.com or visit www.morganparkmusic.org. Morgan Park Summer Music Festival is an all-volunteer nonprofit organization that has been providing free concerts in the park for 55 years. The shows are completely funded through the generous donations that are received from businesses and individuals. Taxpayer money is not requested nor received to bring this high caliber talent to the Festival.